Fujifilm India has launched today its latest model X-T3 in the X Series mirrorless camera range with new X-Trans CMOS 4 sensor and X-Processor 4 image processing engine. Fujifilm X-T3 is world’s first APS-C mirrorless camera capable of 4K/60P 10 bit recording. The X-Trans CMOS 4 sensor is the back-illuminated APS-C sensor with more than 4 times the number of phase detection pixels than current models. It boasts a high S/N ratio and the lowest sensitivity of ISO160 despite its 26MP resolution. The low-light autofocus limit has also been extended to -3EV, enabling accurate AF even in low light conditions, e.g. scene lit only with candlelight. The X Processor 4 has 4 CPU units to achieve image processing speed about 3 times faster than that of current models. It not only boosts AF accuracy and speed substantially, this engine is the world’s first to delivers 4K/60P 10bit output, meeting the needs of professional videographers, in a mirrorless camera equipped with a sensor in the APS-C size or larger. The X-T3 has highest level of 26.1MP resolution in APS-C size sensor. Also, it keeps as low level of noise as current models even increasing the number of pixels. It has 1.5 times faster processing speed than current models to deliver faster and more accurate AF, and substantially enhanced performance in face / eye detection AF thanks to 2.16M phase detection pixels arrayed at entire frame. It supports 4K/60P 4:2:0 10bit internal SD card recording as well as 4K/60P 4:2:2 10bit HDMI output, which can be filmed at the same time. The X-T3 features a 3.69-million-dot high resolution EVF with a high magnification ratio of 0.75x. The display time lag of just 0.005 seconds and refresh rate of approx. 100 fps ensure smooth display of motions, allowing you to precisely identify subject movements and focus positions. The new “Sports finder mode” makes it easy to capture a moving subject. The mode shows approx. 16.6M (1.25x crop) area marking in the LCD/viewfinder, and shoots the area within the marking. This is particularly useful for sports photography and wildlife photography, as you can check the movements of a subject just outside the shooting frame and take advantage of shorter-than-usual blackout time. The X-T3 inherits X-T2’s popular design features such as the positioning of dials on the top panel, central viewfinder style for added sense of stability, and excellent grip design for comfort. Vertical Battery Grip VG-XT3 is priced Rs 25,999– This grip is dust-resistant, water-resistant and capable of operating at temperatures as low as -10°C. It fits two batteries, bringing the total number of batteries to three, including the one on the camera body, to increase the maximum number of frames that can be taken per charge to approx. 1,100 (Normal mode). The camera does not need to suspend its operation to switch to a new battery, even during continuous shooting or video recording, providing a stress-free shooting experience. 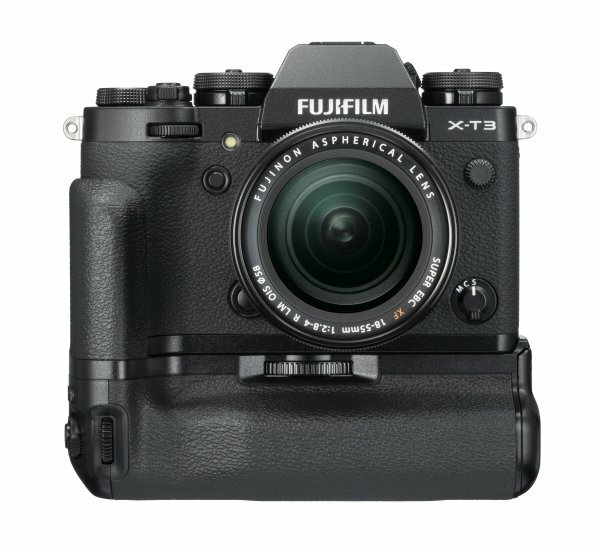 The X-T3 Body is priced Rs. 117,999 and the X-T3 with 18-55 mm lens is priced Rs. 149,999. The X-T3 is available in two colors – Black and Silver.